Everyone is here! And we mean everyone: 74 fighters are available from launch in Super Smash Bros. Ultimate – with the five DLC characters coming this year bringing that up to 79. While you wait for the DLC fighters to land – Piranha Plant and Persona 5's Joker among them – it’s probably for the best that you work on unlocking that starting 74 for maximum Smash Bros. chaos, either with your friends at home or matchmaking with enemies through Nintendo Switch Online. Alas, in an homage to the first game, Smash Ultimate starts you out with a measly eight characters. This means that it’s going to be a long time before you hit that fabled 74 if you don’t know what you’re doing. Luckily, that’s what this guide is for. Let’s begin! This is a fairly slow burn, but it’s worth knowing that playing through World of Light is a guaranteed means to unlock characters in Ultimate. As you venture through the board game-esque overworld to fight Galeem, you will come across tonnes of fun spirit battles but also the occasional fighter who needs to be ‘awakened’ through the throes of battle. Often, these fighters will be hard to access due to a gauntlet of spirit battles standing between your character and the icon, or sometimes a spirit puzzle, where you have to defeat a certain character to later use them to unlock a route through. To get to Captain Falcon, for example, you need to defeat another F-Zero pilot so they can navigate a circuit to his icon. All of these variables add up, so if you’re looking to unlock the entire roster fast this may not be the best method. However, if you don’t mind waiting and want to enjoy the story as much as possible, the World of Light method is worthwhile. Also, if you’re struggling to fight challengers in other modes, World of Light allows you to drop the difficulty and rematch almost instantly, meaning you don’t have to deal with Luigi side-smashing you into oblivion and the painful fade to black that follows. If you’ve played a previous Smash instalment you’re most likely familiar with Classic Mode. It’s essentially a standardized gauntlet where the chosen character has to make their way through a set of varied fights before racing through a bonus round and defeating the boss. You can choose the ‘intensity’ at which you play to cater to your own ability, and the difficulty will scale as you play and provide a decent challenge. In Ultimate, you start with the original eight characters from the original Super Smash Bros., with different challengers appearing after completion depending on who you choose to play through Classic Mode with. Now, this is kind of spoiler territory, but a Reddit user posted an extremely helpful table to consult if you want to speed through and get your main. Don’t look if you want to go through the motions at your own pace, but it’s undeniably the best resource if you’re looking to unlock the characters you want. Basically, who you unlock is predetermined based on who you play through Classic Mode with. This is a much quicker method than World of Light, especially if you want to cater your roster to the character’s you’re most interested in. One of the most controversial additions to Super Smash Bros. Ultimate is the Challenger’s Approach mode, which appears as a little icon in the bottom right of the Games & More section. You will eventually receive a notification about it once you’ve unlocked a few characters and spent a couple of hours with the game. Challenger’s Approach is basically a time-saving roster unlock method wrapped up in a game mode. More often than not (unless you’re a professional) new challengers are going to catch you off guard with their moveset and send you hurtling back to the main menu. Challenger’s Approach lets you boot up an instant rematch where you can choose the character you play as. This means you can pick your main and get revenge on the fighter that scorned you. It’s a nice way to mitigate the random encounters from previous games, but it’s not always there when you need it. If the little gate icon doesn’t appear, simply play something else for a while and come back to take on the challenger. If you’ve failed to defeat multiple challengers in a row, Challenger’s Approach will also cycle through these characters when you play it, which adds an extra dimension of fun. Outside of simply playing the game with friends and letting the characters naturally unlock, there are no other direct means to pick up new fighters. However, there is a sneaky way to game the system that has been circulating online. Fair warning though, it does kind of ruin the fun. 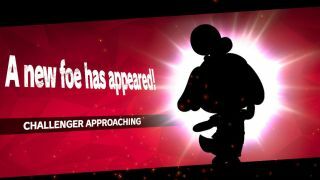 Alas, If you’re keen to complete the roster sooner rather than later, you’re going to want to wait until you fight a new challenger. Once you’ve completed the battle and you’re back on the main menu, simply hit the Home button on your Switch, press X and then choose to close the software. Boot the game back up and head into a Smash battle. Figure out a ruleset that will make this match as fast as possible (1 stock or low time limit should do the trick,) and then fall off of the stage or quickly wipe out your opponent with a smash attack or two. After the results screen you should hit another Challenger Approaching screen with a brand new character, different to the one you just faced. Regardless of whether you win or lose, your new friends will be saved up in the Challenger’s Approach mode for you to try later. Keep at it and you’ll hit the elusive 74 in no time. The options given above will only get you the 74 launch fighters: plenty to be getting on with, but the completionists among you won't be happy unless you unlock every character available. Super Smash Bros. Ultimate is getting five additional DLC fighters over the next year, the first being Piranha Plant (Super Mario series) and the second being Joker (Persona 5). The former is already available for those who pre-ordered the game and claimed the free DLC code before January 31, while Joker is planned for later in the year. You can buy each of the five Challenger's Packs individually for $5.99 (£5.39 / AU$7.80), which bundles in a new fighter, new stage, and new soundtrack for the game. Alternatively you can buy an all-inclusive Fighters Pass for $24.99 (£22.49 / AU$32.50), which nets you each pack as it arrives, as well as a Mii Fighter outfit based on Xenoblade 2's Rex.